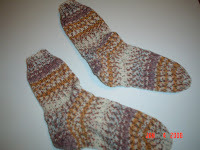 These are the "tiger" socks I knit for my oldest grandson. I wasn't able to finish them before Christmas, but I did finish them the first couple of weeks in January. They are made from Opal sock yarn. He finally wore them this weekend, after Hailey tried to steal them. Mom found them in her drawer. She said, "Well they were on my bed." Logan loves them. "Thanks Grandma."